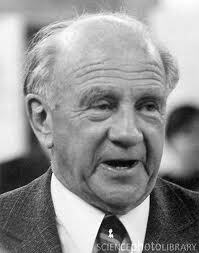 Werner Heisenberg was born on 5th December, 1901, at Würzburg. He was the son of Dr. August Heisenberg and his wife Annie Wecklein. His father later became Professor of the Middle and Modern Greek languages in the University of Munich. It was probably due to his influence that Heisenberg remarked, when the Japanese physicist Yukawa discovered the particle now known as the meson and the term "mesotron" was proposed for it, that the Greek word "mesos" has no "tr" in it, with the result that the name "mesotron" was changed to "meson". Heisenberg went to the Maximilian school at Munich until 1920, when he went to the University of Munich to study physics under Sommerfeld, Wien, Pringsheim, and Rosenthal. During the winter of 1922-1923 he went to Göttingen to study physics under Max Born, Franck, and Hilbert. In 1923 he took his Ph.D. at the University of Munich and then became Assistant to Max Born at the University of Göttingen, and in 1924 he gained the venia legendi at that University. From 1924 until 1925 he worked, with a Rockefeller Grant, with Niels Bohr, at the University of Copenhagen, returning for the summer of 1925 to Göttingen. In 1926 he was appointed Lecturer in Theoretical Physics at the University of Copenhagen under Niels Bohr and in 1927, when he was only 26, he was appointed Professor of Theoretical Physics at the University of Leipzig. In 1929 he went on a lecture tour to the United States, Japan, and India. In 1941 he was appointed Professor of Physics at the University of Berlin and Director of the Kaiser Wilhelm Institute for Physics there. At the end of the Second World War he, and other German physicists, were taken prisoner by American troops and sent to England, but in 1946 he returned to Germany and reorganized, with his colleagues, the Institute for Physics at Göttingen. This Institute was, in 1948, renamed the Max Planck Institute for Physics. In 1948 Heisenberg stayed for some months in Cambridge, England, to give lectures, and in 1950 and 1954 he was invited to lecture in the United States. In the winter of 1955-1956 he gave the Gifford Lectures at the University of St. Andrews, Scotland, these lectures being subsequently published as a book. During 1955 Heisenberg was occupied with preparations for the removal of the Max Planck Institute for Physics to Munich. Still Director of this Institute, he went with it to Munich and in 1958 he was appointed Professor of Physics in the University of Munich. His Institute was then being renamed the Max Planck Institute for Physics and Astrophysics. Heisenberg's name will always be associated with his theory of quantum mechanics, published in 1925, when he was only 23 years old. For this theory and the applications of it which resulted especially in the discovery of allotropic forms of hydrogen, Heisenberg was awarded the Nobel Prize for Physics for 1932. His new theory was based only on what can be observed, that is to say, on the radiation emitted by the atom. We cannot, he said, always assign to an electron a position in space at a given time, nor follow it in its orbit, so that we cannot assume that the planetary orbits postulated by Niels Bohr actually exist. Mechanical quantities, such as position, velocity, etc. should be represented, not by ordinary numbers, but by abstract mathematical structures called "matrices" and he formulated his new theory in terms of matrix equations. Later Heisenberg stated his famous principle of uncertainty, which lays it down that the determination of the position and momentum of a mobile particle necessarily contains errors the product of which cannot be less than the quantum constant h and that, although these errors are negligible on the human scale, they cannot be ignored in studies of the atom. From 1957 onwards Heisenberg was interested in work on problems of plasma physics and thermonuclear processes, and also much work in close collaboration with the International Institute of Atomic Physics at Geneva. He was for several years Chairman of the Scientific Policy Committee of this Institute and subsequently remained a member of this Committee. When he became, in 1953, President of the Alexander von Humboldt Foundation, he did much to further the policy of this Foundation, which was to invite scientists from other countries to Germany and to help them to work there. Since 1953 his own theoretical work was concentrated on the unified field theory of elementary particles which seems to him to be the key to an understanding of the physics of elementary particles. Apart from many medals and prizes, Heisenberg received an honorary doctorate of the University of Bruxelles, of the Technological University Karlsruhe, and recently (1964) of the University of Budapest; he is also recipient of the Order of Merit of Bavaria, and the Grand Cross for Federal Services with Star (Germany). He is a Fellow of the Royal Society of London and a Knight of the Order of Merit (Peace Class). He is a member of the Academies of Sciences of Göttingen, Bavaria, Saxony, Prussia, Sweden, Rumania, Norway, Spain, The Netherlands, Rome (Pontificial), the German Akademie der Naturforscher Leopoldina (Halle), the Accademia dei Lincei (Rome), and the American Academy of Sciences. During 1949-1951 he was President of the Deutsche Forschungsrat (German Research Council) and in 1953 he became President of the Alexander von Humboldt Foundation. One of his hobbies is classical music: he is a distinguished pianist. In 1937 Heisenberg married Elisabeth Schumacher. They have seven children, and live in Munich.